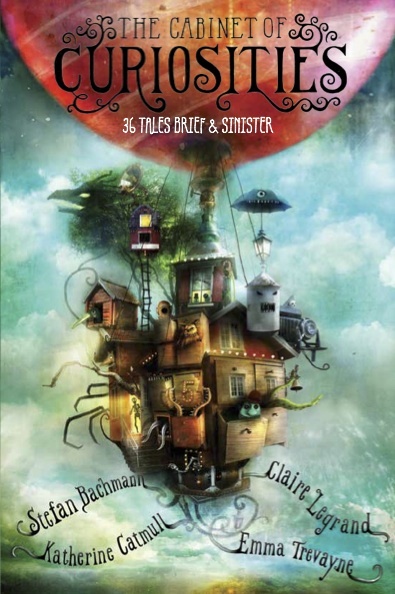 Cover art by Alexander Jansson. TELEGRAM! The Cabinet of Curiosities was chosen as one of the New York Public Library's 100 Best Children's Books of 2014. It put us all a-flutter, and I think Stefan's still in the air interfering with flights over Zurich. And it's also a Junior Library Guild selection, she added modestly, as well as a one of the Bank Street Best Books of the Year. And the Horn Book chose us as one of their ten 2015 Summer Reading selections, advising that the book "will give readers a delicious chill"--a handy way to lower those frightful air conditioning bills. The book also received stars from both Kirkus ("Four of horror fantasy's newer stars . . . a hefty sheaf of chillers") and Publishers Weekly ("Readers who enjoy their Halloween chills all year round will find this anthology a delight."). We are keeping those two stars in a little iron cage under our stairwell, where they sing mournfully, and sulk. And how pleasant: Shelf Awareness says, "Readers will become addicted to these 36 short stories . . . The book is thick, but the tales fly by. It makes a great read-aloud in bits and snatches for a family road trip, or straight through on a rainy afternoon." And why look! Booklist says, "While a few [of the stories] contain lessons that can be learned, the majority exist simply to give readers a fright or chill. And this they do quite well. Not for the faint of heart, this curious collection of stories will haunt and, at times, horrify and are best read by flashlight." And the Horn Book very charmingly notes that "The stories are remarkable both for their uniformly high quality and for their distinctness from one another; the abundant atmospherics, including occasional stark black-and-white illustrations, provide a unifying sense of dread. The framing device—the curators send letters from the field introducing their latest discoveries—adds depths of mystery, danger, and idiosyncrasy to a book already swimming in each." EnterTheCabinet.com is a curious and disturbing little project: a collaboration among four writers of middle-grade fantasy: Stefan Bachmann, Claire Legrand, Emma Trevayne, and Katherine Catmull. Each Wednesday, one of these Cabinet curators posts a creepy, spooky, or simply quite scary short-short story: stories of fairies, ghosts, creatures from the deepest sea; stories of evil magic, evil luck, and evil dolls. Now 36 of these brief, terrifying tales have crept and crawled into a volume you can hold in your own trembling hands. The Cabinet of Curiosities includes eight never-before-seen stories, along with other new material, plus a cover and black-and-white illustrations by Alexander Jansson, who draws this kind of unnerving thing. You can order The Cabinet of Curiosities now at your local bookstore, or Amazon, or Barnes & Noble, or any other book-selling cave worldwide. It's rare that the latter are guarded by dragons these days, at least as I understand it.